The Thunderbolts are still having trouble accepting Charcoal on the team, but his origin is tied to Jolt’s as they both have Zola to blame. Hawkeye’s public vow to bring in the new Masters Of Evil succeed in drawing some of them out, but it’s a trap so Crimson Cowl can test her new weather weapon and kill the Thunderbolts at the same time. As the heroes try to gather the remaining citizens to safety the new Citizen V confronts Hawkeye demanding he not get in the way of her revenge, but he shames her about the timing and she tries to stop the beacon for the weather weapon, but someone sneaks up on her. The town is destroyed but the team manages to save the people and track the Masters to their headquarters. Hawkeye’s already choosing the curtains he wants to put up when they learn there are a lot of other members they weren’t aware of. 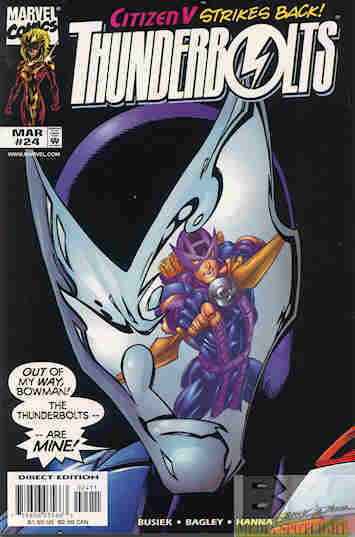 The Thunderbolts are more than a little outnumbered. What they got right: Charcoal’s origin makes sense given the Marvel universe and both of them having been mutated by Zola may allow Charcoal and Jolt to become friends. The action was good, Hawkeye’s plan works well, and he even manages to get through to Citizen V.
What they got wrong: We don’t get to see the devastation (or lack thereof given Jolt’s comments) so I’m wondering how Citizen V survived and who attacked her. Because I’m pretty sure they didn’t kill her off just yet. Recommendation: Another good issue. Give this run a read. Posted by ShadowWing Tronix on October 2, 2018 in Marvel Spotlight, Yesterday's Comics and tagged Arnim Zola, Charcoal The Burning Man, Hawkeye, Jolt, Masters of Evil, Thunderbolts.